Gorgeous Multicolor Floral Bands Large Adult Human Ashes Funeral Urn will make a perfect memorial present to secure ashes of the loved one. 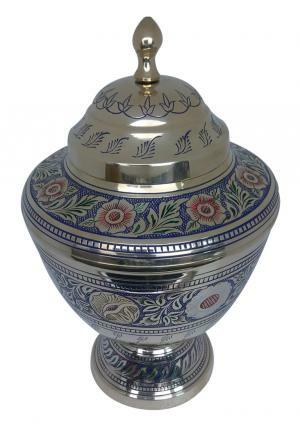 The adult large cremation urn is decorated in multi color floral engravings on pure metallic brass urn. The engravings are beautifully presented with detailed floral leaves aspects. 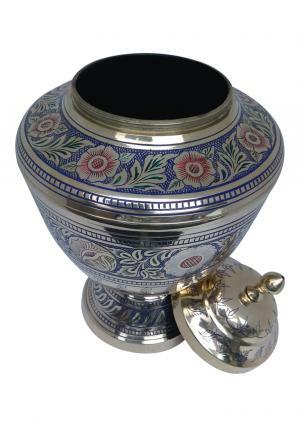 Adult urn has superior base and stand full engravings with bands. 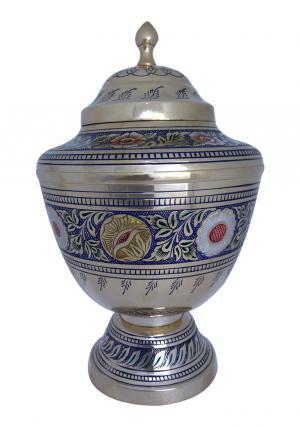 The large adult memorial urn has pointed lid with decorated band of leaves with screw threading from inside to secure the ashes. 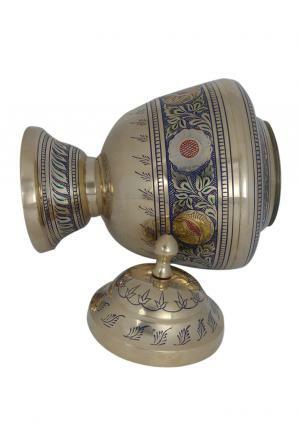 The urn is made of Solid brass metal with multi color enamel that weighs 2.23 kg, stands 11.6 inches tall and 7.3 inch width capable to carry 200 cubic inch of human adult ashes in the urn.